For starters, thanks to a current “Take $50 off your order of $200 or more” promotion (valid until 11.05.08) at the Palm Store you can now get your hands on the super hot Treo Pro for only $499 which is by far the best offer available for this superb smartphone anywhere online today. Simply enter promo code FIFTYOFF (case sensitive) in your cart to apply your $50 discount. Next the Palm Store has also just announced a terrific “25 Hottest Accessories Sale” running until Wednesday, October 29 that sees many bestselling Palm accessories for Centro, Treo 800w and Treo Pro among others at greatly reduced prices (up to 60% off). The above prices are great but it gets even better. If you spend over $200 in accessories you can also benefit from the “Take $50 off your order of $200 or more” promotion (valid until 11.05.08) at the Palm Store on top of the discount already offered. 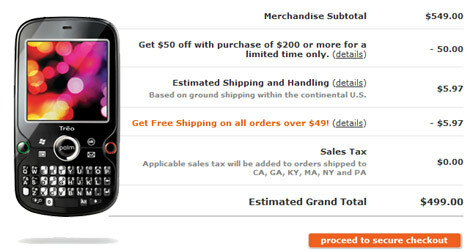 For example, you could get a GPS, case, headset and battery with a cost of $200 and pay only $150 for the lot. There’s no doubt that thanks to this promotion there hasn’t been a better time to buy your Treo Pro for only $499 nor to get your hands on some terrifc Palm accessories at a very greatly reduced price. Having said this, as you will see the overall accessories selection in the Palm Store is rather limited so for greater choice and low prices you’ll naturally always have a much more complete solution at the Treonauts Store and Centronauts Store readily available for all your needs. I am so glad I got the Treo Pro from Dell for $475 just in time! Dell no longer offers it for that low. Amazon has the same offer now!